What is your favorite 70’s or 80’s Rick James Funky Outfit? We have this 1970’s 1980’s Rick James Costume and any of the Motown, Funk, Soul, Rhythn & Blues or Music Genre Artist Outfits. 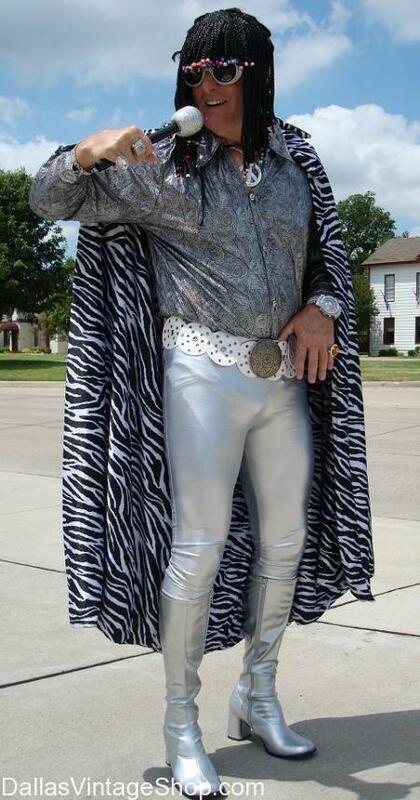 Our Funk Artist, Rick James, Super Freak Costume is always a 70’s & 80’s Favorite for Theme Parties. You will find all the 70’s & 80’s Spandex, 70’s & 80’s Bling, 70’s & 80’s Wigs, 70’s & 80’s Metallic Clothing, 70’s & 80’s Funky Attire 70’s & 80’s, 70’s & 80’s Musicians and more 70’s & 80’s Vintage Clothing and Costumes with all the Accessories you could possibly need. There are Elaborate, Supreme Quality Complete Outfits to put together or you can get just the 70’s & 80’s Economy or Median Priced Costumes or Costumes Pieces and Accessories you nee. Nobody in the Dallas, DFW or North Texas Area has more 70’s & 80’s Vintage Clothing, Costumes or Accessories than Dallas Vintage Shop. We are open all year round. This entry is filed under 1970s Men, 1980s Men, Funk. You can follow any responses to this entry through the RSS 2.0 feed. Both comments and pings are currently closed.